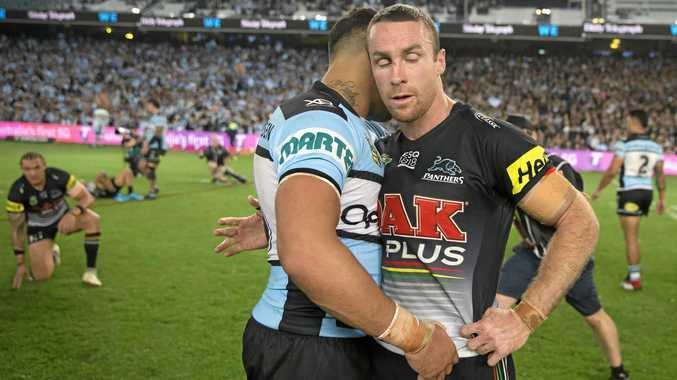 Down 18-0 just before half-time, the Panthers threatened to do the improbable - as they had done so often this year - when Waqa Blake scored to lock up the scores at 20-20 with 10 minutes remaining. Caretaker coach Ciraldo said their habit of giving up big leads ultimately came back to haunt them with their season on the line. He was appointed to the caretaker role after the club punted Anthony Griffin, in large part because of their habit of giving up big leads before fighting their way back into the game. Ivan Cleary, who had been heavily linked to the club, would seem set to stay at the Wests Tigers. Ciraldo was adamant he hadn't put any thought into next year. He is a candidate for the head coaching role. "Whatever my job title is I'll be working my a--- off to make sure we're not in this position again," Ciraldo said. He said Penrith's playing group had to be driven by the heartbreak of this year's finals exit as they headed into 2019.